Ariel's trusted friend. Flounder will do anything for her. He's small and not exactly brave, but he'll never leave Ariel's side, even when it means facing danger. He's not exactly brave, but Flounder is Ariel's most loyal friend. Ursula kidnapped Flounder as part of her plan to trick Ariel and steal the trident. Ariel's trusted friend Flounder would do anything for her. He's small and not exactly brave, but he'll never leave Ariel's side, even when it means facing danger. The youngest daughter of King Triton and her best friend. "Lately, Ariel just stares at the statue and sighs. I wish there was some way we could make her smile." Flounder is Ariel's best friend. He is originally from Disney's The Little Mermaid, and made his first appearance in Kingdom Hearts. When Sora, Donald, and Goofy first arrive, Flounder was chased by Heartless with Ariel and Sebastian, but was saved by the trio. Because Sora and the others were new to the sea world, they did not know how to swim flexibly. Flounder, then became their instructor and was chased so he could teach them. When Ariel and the others set off to find the Keyhole, Flounder was the one who told them about the dolphin that would help them swim against the water currents. Flounder appears as a fragment of Sora's memories. In this story, he was sent to the surface by Ursula so she could use him to make Ariel steal the Trident from her father. Towards the battle, Ariel was supposed to choose between giving the Trident to Ursula or losing Flounder. Ariel willingly gave up the Trident so that Flounder would not lose his life, but Sora defeated Ursula in the end. When Sora, Donald, and Goofy revisited them, Ariel was under deep depression. Flounder wanted to cheer her up, and so he showed them a statue that resembled Prince Eric and asked them to move it to Ariel's cave. When Ariel was turned into a human for three days by sea witch Ursula, he and the others stayed near the princess to assist her. He is also present during most of the Atlantica songs, and in the last performance, sings with Sebastian before Sora and his friends set off. Some time after Xemnas's defeat, Flounder attends the wedding of the now-human Ariel and Eric. Flounder is a round, yellow fish that more closely resembles a convict tang than a flounder. He has sky blue stripes along his top side. His pectoral, dorsal, and tail fins have alternating sky blue and dark sky blue stripes. His dorsal fin lines his back and is frayed near the front, vaguely reminiscent of hair. He seems to have dark eyebrows, a round nose, and a pink, human-like tongue, all dissimilarities to real fish. Flounder's eyes are aquamarine. First and foremost, Flounder is Ariel's best friend. Regardless of how frightened he is, if Ariel is in trouble he will aid her without delay. Above all, he seeks to please Ariel and hates to see her down. This is evident in Kingdom Hearts II on Sora's first visit to Atlantica, when Flounder proposes the group frees a sunken human statue as an uplifting gift to Ariel. Other than his passion for helping his friends, Flounder is scared very easily and cannot handle stressful situations. 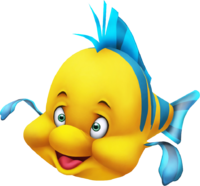 Flounder is also a bit mistrustful of others until he knows them better, as seen in Kingdom Hearts when he first met Sora, Donald, and Goofy. Flounder originates Disney's 1989 movie The Little Mermaid and later appears in its sequel, The Little Mermaid II: Return to Sea. In the film, he is the only character that supports Ariel's fascination with human things. He is first seen sneaking away with Ariel from a concert being held by Sebastian to salvage through a ship graveyard for items that belonged to humans. When Ariel confesses she is in love with Eric, she strikes a deal with an evil sea witch, Ursula. Flounder joins Ariel in her pursuit for Eric's love. Since he cannot survive on land, Flounder is forced to observe from afar and receive get news from Scuttle or Sebastian on Ariel's progress with Eric. Later, Flounder helps Ariel defeat Ursula who is planning to capture Ariel by battling Flotsam and Jetsam. When Ursula is defeated, Flounder attends the wedding of Ariel and Eric, and bids farewell to his best friend. Flounder is voiced in the film by Jason Marin. This page was last edited on 18 March 2019, at 18:42.